Maxillofacial Prosthetics, a subspecialty of prosthodontics, involves the oral and dental rehabilitation of patients with certain disabilities or defects that developed from trauma or disease, or which were present at birth. 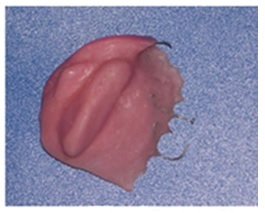 Prostheses are often used to replace missing portions of tissue or bone. 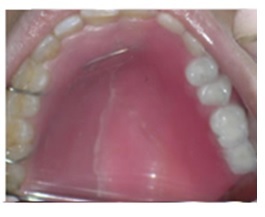 This procedure can help restore ease of speech, and oral functions such as chewing and swallowing. Maxillofacial prosthodontists often work on teams with speech pathologists, radiation oncologists, plastic surgeons, ENTs, oral surgeons, specialty and general dentists, and neurologists. 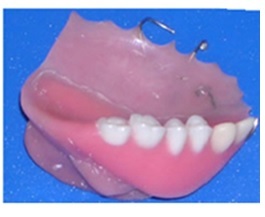 Adding other specialists such as anaplastologists and other ancillary personnel to the team helps in the creation of one of a kind custom fitting dentures or partial dentures. 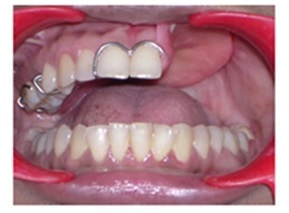 Below is an example of just one of many kinds of maxillofacial dentures.